Leeds United have moved to try to end speculation about the future of star defender Pontus Jansson by handing the Swedish centre-back a new five-year deal. The deal runs until 2022 and shows Jansson is still part of the club’s long term plans despite being dropped for last Saturday’s Sky Bet Championship game at Bristol City. Jansson did return in the team at Leicester City, but in a line-up made up almost entirely of second string players. The new deal comes less than four months after he completed a £3.5m move from Torino when Leeds fought off other clubs interested in the player. 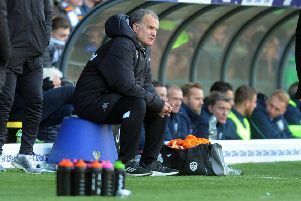 By his own admission he has not been in his best form recently and he looks set to miss out to Liam Cooper and Matthew Pennington for Friday’s game against Sheffield United at Elland Road. But the new contract shows United are going on the old saying that form is temporary and class is permanent after Jansson was outstanding last season in his first at Elland Road. Jansson told LUTV: “I’m really happy of course. It’s felt like a second home since day one. “We came from Italy where it was a little bit tougher, a different type of culture and a different type of football. England is quite similar to Sweden and Leeds were fantastic. “Everyone has been good to me and when I started to play good on the pitch, I got love from the fans.